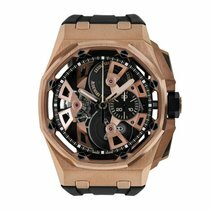 This Royal Oak Tourbillon from famed Swiss watchmakers Audemars Piguet is a distinctly masculine timepiece and will certainly garner much attention. 44mm Everose Gold case, sapphire crystal back, screw-locked crown, glareproofed sapphire crystal, black dial with grande tapisserie pattern, pink gold applied hour-markers and Royal Oak hands with luminescent coating, self-winding Audemars Piguet Calibre 2889 movement and large seconds, approximately 72 hours of power reserve, 18-carat pink gold case, sapphire crystal and caseback. Water resistant to 20 meters.